If you attempt to take away part of someone’s identity, there are consequences. We have watched as you have led us to the edge of the abyss. We will watch no longer. You have taken lives on our side. Now we will take lives on yours. 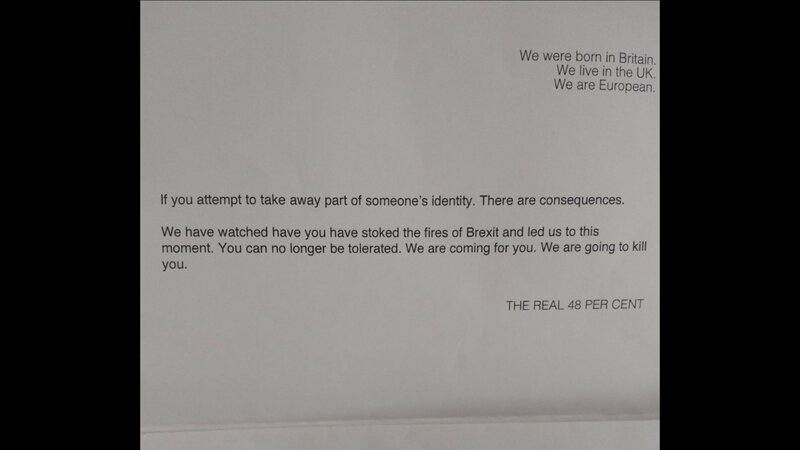 The letter was personally addressed to her at the House of Commons, a targeted letter not some random attack. It, however, is not the first. The response to Zac’s initial tweet was not positive, with BBC’s St. John Stephen responding saying it should have been addressed to Zac Goldsmith. Considering the recent aggressive storming of a talk given by Jacob Rees-Mogg, in which a fight broke out, are these events indicative of a potential rise of left-wing violence here in Britain, similar to what is seen in the states? The Department of Homeland Security has been warning of violence from left-wing anarchists since early 2016 and has labelled them as “domestic terrorists”. Berkeley was swarmed with the se rioters, who were caught attacking peaceful right-wing demonstrators. AntiFa can easily be identified by their black-bloc attire and have been defended by left-wing organisations such as HopeNotHate, who are unhappy about the negative press coverage AntiFa receive. The aggressive storming of Jacob Rees-Mogg’s talk, a staunch Brexiteer, plus these two threats against Zac Goldsmith MP and Andrea Leadsom MP, point to a potential revival of left-wing anarchist violence. These thugs need stamping out.